As the Ukraine marks the one year anniversary of the pro-Europe protests which ousted then president and Kremlin-ally Viktor Yanukovych they will commemorate the ‘Heavenly Hundred’ – the men and women who lost their lives in “Euromaidan.” Named for the Maidan, Kiev’s main square, where more than 50 people were shot and the bulk of the protests took place. The total killed during police clashes is estimated between 110 and 123. As a result Ukraine elected a pro-European government and president, Petro Poroshenko and made constitutional changes. Unfortunately, this did not solve the country’s problems but lead to confrontation with neighboring Russia, culminating in Putin’s illegal annexation of the Crimea, March 16, 2014. Eastern Ukraine still remains embroiled in a war with Russia-backed separatists that has killed over 5,600 people and forced a million to flee. With 49 attacks in the past 24 hours according to a Ukrainian military spokesman, accompanied with Russia sending 20 tanks, 10 missile systems and busloads of troops into Eastern Ukraine according to another military source, it appears the latest ceasefire agreement will again fail as quickly as it was put in place. As the conflict persists, I ask myself why does Putin continue to escalate hostilities and more importantly what is his ideology. Back in March, President Obama declared Putin “has no ideology.” I think the President again demonstrates his ignorance akin to calling ISIS a JV team. The one time KGB agent does have an ideology, one steeped in new found hard line nationalism, and the restoration of the Old Russian Empire. 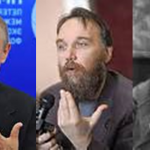 However, who I find more disturbing than Putin is the author of this “Great Russian Nationalism,” Alexandar Dugin. Most Americans have probably never heard of him but it is time we pay attention to this threat. While its territorial goals are to restore the lands once held by czarist Russia, “Eurasianism” would replace the old Marxist nonsense of a class struggle with one of “sacred geography”. To Dugin this will lead to an inevitable conflict of the continental Eurasia with the “Atlantacism” of the US, Canada and the UK.